Grease and line n 8 inch square baking tin with baking or parchment paper, ensuring two sides overhang. Preheat oven to 180 C (360 F). In a large mixing bowl, cream butter and sugar for 3-4 minutes with an electric beater or until pale and creamy. Add vanilla, egg and egg yolk and beat again until combined. Sift in flour, baking soda and cornflour and beat until a soft dough forms. Add HALF the chocolate chips and gently stir. Divide the dough into two and press half of the cookie dough into the bottom of your pan to form one even layer. Add the Nutella and spread almost to the edges, leaving a little space on every side. 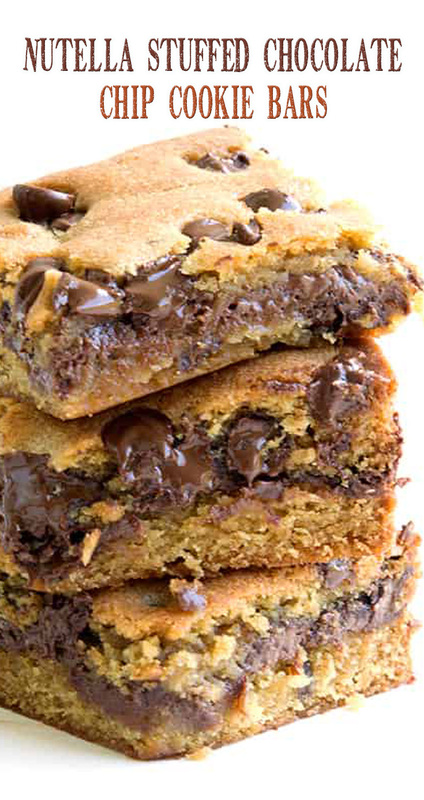 Then grab the other half of your cookie dough and break it up into pieces and pop on top of the Nutella. You will then need to spread it out so the Nutella is fully covered. Press the remaining chocolate chips on top. Pop into the oven for approximately 18-20 minutes or until golden brown on top. Leave to cool completely in the tin before removing. Cut into slices and serve.